There’s no better way to honor your new fur baby, best friend and loyal companion than with a personalized keepsake session of photographic memories. Time flies by so quickly, and with every moment being precious, I want to help you cherish the best of times for a long time to come. Pets are such a huge part of our daily life and happiness. Their spirits are so bright, loyalty limitless and joy contagious. Animals of all sizes and shapes have been at the center of my life since I can remember and I’m so grateful to have had the opportunity to work with, rehab, and photograph a wide assortment of rescued wildlife and domestic animals including: elephants, primates and wolves as well as the domestic pets we share our daily adventures with. I've also been so fortunate to have several of these wildlife images featured by: National Geographic, Wildlife Photo Magazine, WildEarth Guardians and the National Park Service. Capturing the absolute essence of your beloved pet(s) is at the very root of what I do. I love setting up our comfortable and relaxed session in a place where they are most at ease and able to do what they love. Whether that be chasing a ball on the beach, rolling in the grass, burying a stick, taking a stroll on the hill or just relaxing in your home environment. Preserving each of those fleeting moments for you in an organic and unrushed way not only makes the images captured more precious, but it makes the session much more fun for all. Your custom tailored session is preceded by a detailed telephone consultation to really get to know you and your animal family. Their name, their age, their favorite hobbies, their quirks and their charms. I’d love to know more about you as their fur parent too, and some of your favorite times together – some of which hopefully we can capture on camera. 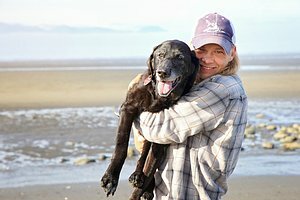 Combining my professional expertise and your special bond with your pet we can come up with unique themes and settings that will be the best way of highlighting all those traits and relationships that make he/she hold such a special place in your heart. During this pre-session telephone consultation we will pick a date, time and then once the deposit and executed contract have been received the special day is officially all yours. You will receive an email confirmation to “Save the Date” containing a carefully prepared Welcome Packet to help answer any more questions and help you to get ready for the special day. With every custom designed photo session you will receive your own complimentary 4x6 photographic copies of all professionally retouched proofs. You will also receive low-resolution, watermarked, digital negatives to share with all your friends, family and your pet’s fan club on social media platforms. Within 14 days of our photo shoot you will receive an online gallery link and access code for viewing the digital proofs. 20-30 professionally retouched proofs are average per session. Your gallery will be active for 30 days to allow for ordering of your favorite images in the perfect print media size and style for your home. All fine art products will be hand delivered and a delivery estimate can be given at the time of order. All package options as well as a la carte print and product pricing will be included with your Welcome Packet to allow for budgeting in advance. I also offer free in-home consultation to assist in review of images, measurement of wall space and guidance regarding the best print options for your custom home or office artwork from our session. Although each session is custom tailored to meet your needs, you can expect us all to be together for around 90 minutes. Each pet is different, some warm up more quickly, some wear out more quickly, so if we’re able to get a variety of amazing shots in a shorter timeframe then that’s great, but I anticipate allowing for enough time to be able to work my magic. *All of my sessions are "flash free" so there's no discomfort or harm to your pet's eyes during the photographic process. Prices shown below are the charges for your photographic experience on Maui (South, West, North & Upcountry). 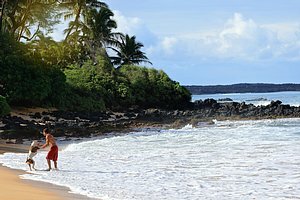 Services on neighboring islands, out of state, and/or remote Maui locations are available but subject to a different pricing schedule. Custom printed artwork and/or digital negatives are available for purchase separately and will be chosen from your online proof gallery. Pets adopted from one of our local rescue organizations or shelters will be eligible to receive a complimentary 8x10 or 8x12 print from your proof gallery. There’s no time more exciting than the arrival of your new little furry bundle of joy. It’s SO fun to get to know the new baby and savor all those moments playing, sleeping and being caught up in mischief. For new pet parents who’d love to document the first year with your new little one. 3 separate sessions are included within a 12 month period to capture all those adorable changes, growth spurts and new tricks. This time is designed to accommodate a variety of portrait concepts including special occasions like holidays or birthdays and can even be scheduled simply as a way to say “I love you” to your pet. There are never too many good memories. As your dog ages and enters its senior years the Celebration of Life session is a perfect way to capture your old friend’s peaceful days. *Rush appointments are available for those loved ones who’s time is near. Each session price shown above includes up to 2 pets living in the same household and their 2 humans. Each additional person is $25, additional location is $75, additional pet in same household $50. For each Pet Portrait Session that I complete, a 5% donation will be made in your pet's name to either the Maui Humane Society or the Hawaiian Animal Rescue Foundation (HARF) – you choose! It’s my hope that these donations will help another family find their new forever friend too.